Light from the moon left its surface 1.5 seconds ago; sunlight travels for 8 minutes and 19 seconds before it touches your skin. The farther out into space we look, the farther back in time we can see. As curator on this project, I worked with artist Alicia Eggert to come up with an installation that focuses on the relationship between language, image and time. We partnered with MM Partners, a developer in the Brewerytown section of Philadelphia, to utilize a building that will soon undergo a transformation as a setting for the work. 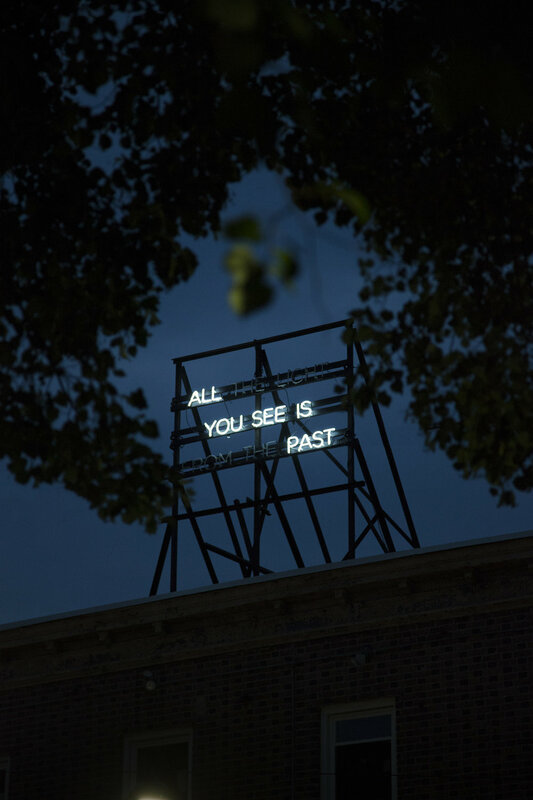 A singular flashing neon sign was installed that cycles through the statements “all the light you see is from the past” and “all you see is past” before turning off completely. The piece is about the idea that light takes time to travel, so by the time it reaches your eyes, everything you are seeing is technically already in the past. Light from the moon left its surface 1.5 seconds ago; sunlight travels for 8 minutes and 19 seconds before it touches your skin. The farther out into space we look, the farther back in time we can see.The installation, perched atop a building that will soon be demolished, is an image of what was. What will be remains to be seen.